Garmin Striker 4dv has an average rating of 3.4 out of 5 based on 5 user reviews. No one wants to waste time casting their line into an empty stretch of water. The Garmin Striker 4dv is designed to be easy to use while eliminating the guesswork, so fishermen can focus on the true challenge of the sport. The Garmin Striker 4dv has a compact form that fits easily into any size of boat. The whole device weighs only 8 ounces. Its face is just 5.9 by 3.6 inches while being only 1.6 inches thick. 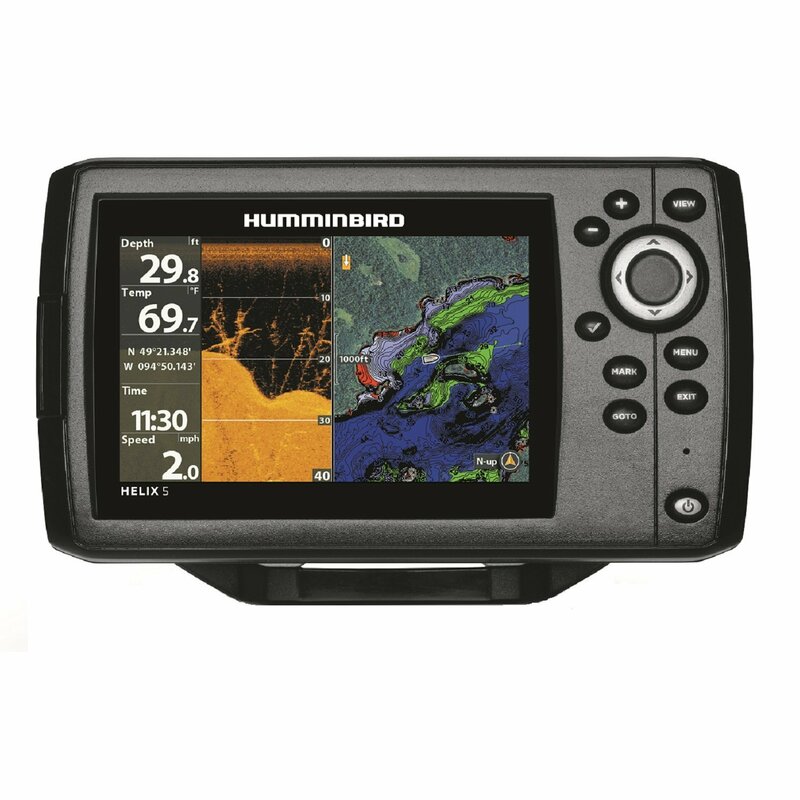 A 3.5 inch diagonal screen provides a 480 by 320 pixel window to the seascape beneath your craft in clear, vivid colors and is accompanied by a cluster of control buttons. Connected by its power cord, the device uses 300 watts to generate its sonar signals. With the included swivel/tilt mount, the unit can be secured in any watercraft and positioned for optimal access. Along with the compact monitoring unit, a GT20 transducer is included to produce and gather the sonar pulses and pass them on to the base unit for visual display. In particular, it handles the 77, 200, and 455 kHz frequencies that give full coverage of the underwater environment. Transom and trolling motor mounts make it easy to put the transducer into action. To tap into the maximum capabilities of the Striker 4dv, like its 800 kHz sonar, either a separately marketed GT22 or GT23 transducer is recommended. The Striker 4dv doesn’t just give you a general sense of where the fish are, it shows their individual locations in sharp detail. Just as important, it reveals hidden obstacles that could ruin your whole endeavor. Imagine getting your line entangled on a piece of junk lying on a lake bottom and being forced to cut it free. Even worse, think of tugging on the line and causing the debris to shift and yank your expensive pole into the water. In order to uncover what’s going on below, the Striker 4dv starts with multiple sonar frequencies. Basically, lower frequencies like 77 kHz are able to reach deeper into the water, but they do so at the cost of a sharp picture. This device offers maximum penetration of 830 feet in saltwater and 1,750 feet in freshwater. A higher frequency like 200 kHz creates fine details but with less distance. The Garmin Striker 4dv can delve to a depth of 750 feet without sacrificing a clear image by generating both 77/200 kHz waves and 455/800 kHz DownVu frequencies that utilize CHIRP or Compressed High Intensity Radiated Pulse technology. Unlike older transducers that carry only one frequency, the GT20 transducer included in the package manages a spectrum of CHIRP frequencies for both depth and clarity. Once the sonar signals are collected, the Garmin Striker 4dv provides several ways to display them. Standard CHIRP wavelengths create images revealing individual fish specimens with their sizes indicated by color. DownVu CHIRP supplies realistic pictures that expose every inch of the underwater terrain. Through the use of the split screen, scans from individual frequencies can be shown side by side or top and bottom with zoom capability for closer inspection. Additional relevant information like water temperature and depth markings in feet are shown on the display. For the fastest sonar readouts, a flasher mode is available. This screen uses the traditional fish finder display featuring a circular sonar sweep with various depth levels given clockwise. Objects like fish, the fishing lure, and the lake bottom are shown as radial lines of varying thickness and color depending on their size and density. In addition to showing sonar readings, the Garmin Striker 4dv provides a waypoint map display. Waypoints such as landmarks or locations of interest like rich fishing spots can be labeled on the screen. The device then harnesses its GPS capabilities to visually trace your direction and distance across the water. Besides the displayed map, this information is shown in a numerical chart along with boat speed, distance to desired location, and estimated time of arrival. This approach offers a simple, intuitive way to record those ideal locales that doesn’t involve interpreting site-specific maps. Working together, the sonar and mapping abilities of this unit take care of the uncertainties of fishing and let you concentrate on formulating the perfect bait. You can get a great deal on Garmin Striker 4dv here. This is a fantastic fishing tool. Like most Garmin products it is intuitive and easy to read. The brightness and high resolution make it easy to see in direct sunlight – even when I’m wearing sunglasses. You are not gonna find a better unit for the price. Garmin delivers on all their promises and keeps the cost down at the same time. It has everything you need in a compact, affordable package. I dont think you will find a better sounder for the money well done Garmin! My review of the Striker 4DV could be summed up in one word: AWESOME! It seems like very high-tech, quality equipment. Operation is intuitive, and the display is crisp even in bright sun. It will run comfortably off pretty much any power source between 10 and 20 volts. I was able to hook one up to an old laptop battery. You’ll have to contact tech support for more info. I don’t have a lot of patience for them; even registering for the warranty is a headache. But the 4DV itself is well worth it. When I researched the Garmin Striker 4, I read that the unit would include a transducer. However, it arrived without one. This was embarrassing as I took it to the marina to have it installed. I called support and was told “nope, no transducer”. I would not have purchased it if I knew I still had to buy a transducer to go with it. I feel like this is misleading and Garmin should be more upfront about this.